If you're a sports fan, you probably have tens, maybe hundreds of baseball caps with your favorite teams' logos on them. You may have spent a small fortune on those caps, just so you can display that logo. Why keep spending money on those caps and all those logos when you can buy one baseball cap with many logos--Live Lids. The Live Lids baseball cap employs an LED screen to showcase the logos of your favorite teams. All you have to do is buy a cap, download the CapSync software, connect your cap and then sync and upload your logos and images. Live Lids caps come in a variety of colors and multicolored options, and all of the caps have a snap back, so one size fits all. There are controls on the brim of the Live Lids cap that allow you to choose which images to display and whether or not you want them still or transitioning from one to another. Live Lids can hold up to 100 images, which you can store in up to four folders in the CapSync software. 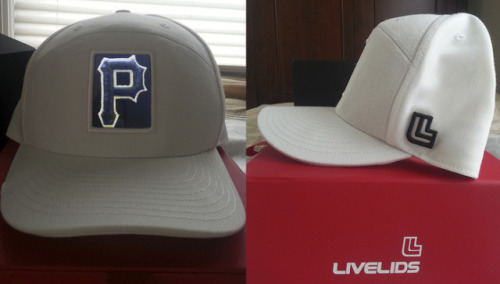 With Live Lids, you can upload images of your favorite players, different logo designs and colors or your own artwork. Live Lids has licensing agreements with the MLB, NBA and NFL Players Association so you can get all of the official logos and play them for up to 11 hours on a single charge. Your first 20 images are free, and after that they're just 69 cents a piece. The Live Lids baseball cap itself is $75, which is about twice as much as a fitted baseball cap, but with all of the options for image and logo display, it isn't a bad deal. You can find out more information on this product and order at the LiveLids site.